Stay in the heart of beautiful Coeur d'Alene and enjoy all the comforts of home this Idaho hotel has to offer. Just outside this Coeur d'Alene, ID hotel, guests will find fun and excitement. Take in the thrills of the Silverwood Theme Park, boat around Lake Coeur d'Alene, play the links at the Coeur d'Alene golf course or simply explore the breathtaking views by hiking around the nearby mountains and lakes. Guests can even go horseback riding, fishing, boating, hiking, and biking. The North Idaho College is also located nearby, which makes this hotel in Coeur d'Alene perfect for families visiting campus. 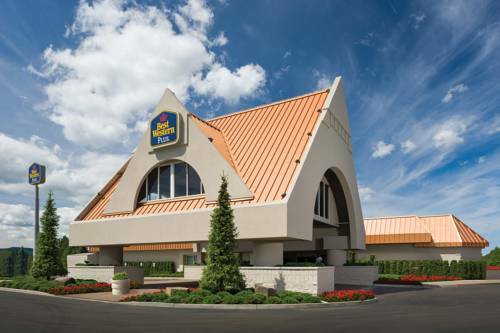 Guests of the Best Western Plus Coeur d'Alene Inn will enjoy staying in spacious, comfortable, 100% smoke free rooms, each complete with a refrigerator, cable satellite television and high-speed internet access. This hotel in Coeur d'Alene, Idaho also offers an on-site restaurant - where kids eat free, an indoor heated swimming pool and hot tub, on-property fitness center and a cocktail lounge. Pets are also welcome at this hotel in Coeur d'Alene for a small fee. Business guests travelling to this Coeur d'Alene, ID hotel will enjoy the on-site full-service business center and 13,000 sq. ft. of meeting space, in addition to a close proximity to area businesses, like the Hecla Mining Company, Kootenai Medical Center, Louisiana Pacific and Kaiser Aluminum. For superior service, comfort and value, book a stay online today and save with the Best Western Plus Coeur d'Alene Inn. Enjoy your stay. Mulligan's: Mulligan's, on premises, full service, American, open for: breakfast, lunch, dinner, 6:00 a.m. to 9:00 p.m.
Outback Steakhouse: 0.75 mile(s) from Outback Steakhouse, full service, American, open for: lunch, dinner, 4:00 p.m. to 11:00 p.m.
Red Lobster: 0.75 mile(s) from Red Lobster, full service, seafood, open for: lunch, dinner, 10:00 a.m. to 10:00 p.m.
Mulligan's Lounge: Mulligan's Lounge, on premises, bar/lounge, American, open for: lunch, dinner, sports bar, 11:00 a.m. to 10:00 p.m.
Paddy's: 0.2 mile(s) from Paddy's, bar/lounge, American, open for: dinner, billiards, 11:00 a.m. to 1:00 a.m.
Beverly's: 2 mile(s) from Beverly's, full service, American, open for: breakfast, lunch, dinner, fine dining, open 11:00 a.m. to 11:00 p.m.
Chili's: 0.75 mile(s) from Chili's, full service, American, open for: lunch, dinner, 11:00 a.m. to 11:00 p.m.
Dragon House: Adjacent to Dragon House, bar/lounge, American, open for: lunch, dinner, 11:00 a.m. to 11:00 p.m.
Billiards - 0.2 mile(s) from Paddy's, bar/lounge, American, open for: dinner, billiards, 11:00 a.m. to 1:00 a.m.
Fine dining - 2 mile(s) from Beverly's, full service, American, open for: breakfast, lunch, dinner, fine dining, open 11:00 a.m. to 11:00 p.m.
From: The North. Follow Highway 95 South until you reach Appleway. Turn right on Appleway and then left into our parking lot. The Best Western Plus Coeur d'Alene Inn is behind the Mobil Service Station. We are approximately 45 miles from Sandpoint. From: The South. Proceed North on Highway 95 until you cross over the Interstate. Turn left on Appleway. The Best Western Plus Coeur d'Alene Inn is behind the Mobil Service Station. We are approximately 45 miles from Sandpoint. From: The East. Follow Interstate 90 West into Coeur d'Alene. Take Exit 12 and turn right, then turn left on Appleway. The Best Western Plus Coeur d'Alene Inn is behind the Mobil Service Station. We are approximately 45 miles from Sandpoint. From: The West. Turn left off the exit which will take you over Interstate 90. Turn left on Appleway. The Best Western Plus Coeur d'Alene Inn is behind the Mobil Service Station. We are approximately 45 miles from Sandpoint. North Idaho College,2.00 mile(s) from North Idaho College, featuring branch campuses for the University of Idaho and Lewis and Clark State College.